Our lawyers have extensive experience litigating claims on behalf of and against a wide range of licensed professionals -- including lawyers, accountants, and health care practitioners. For years, professionals whose reputation and livelihood are on the line have turned to Todd & Weld for sound advice and an aggressive defense. We have represented prominent lawyers and some of the largest law firms in Boston in professional malpractice claims and in disciplinary proceedings before the Massachusetts Board of Bar Overseers. Medical professionals facing challenges to their licenses and accreditation regularly turn to Todd & Weld attorneys to represent them before the various licensing boards in Massachusetts, including the Board of Registration in Medicine. Our lawyers have counseled accountants and other professionals in negligence claims and before various licensing boards. 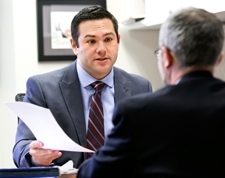 Todd & Weld's professional liability practice is not limited to representing professionals. When a lawyer, accountant, or other professional breaches their client's trust, the client often turns to Todd & Weld to help right the wrong. Whether taking the client's case to trial or reaching a settlement on favorable terms, we have the skills and expertise to help clients recover their professional liability losses.